The annual Day of Prayer for Survivors and Victims of Abuse takes place on Friday 15 February 2019, just one week before the historic gathering in Rome hosted by Pope Francis on 21-24 February Rome to discuss the safeguarding of minors in the Church. We ask for your prayers for all those who have been hurt by abuse in the Church. We pray for Pope Francis and for the success of the meeting in Rome at which senior bishops and religious superiors from around the world will be attending. 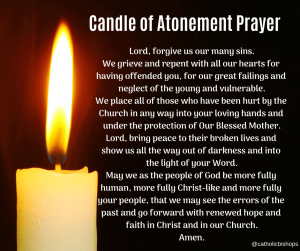 We invite you to join us for a liturgy to bless and dedicate a new ‘Candle of Atonement’ in the Cathedral of the Assumption on Friday 15th February at 10am. This Candle will be lit in our diocese as a reminder of the need for atonement and to symbolise repentance, light in the darkness and hope.